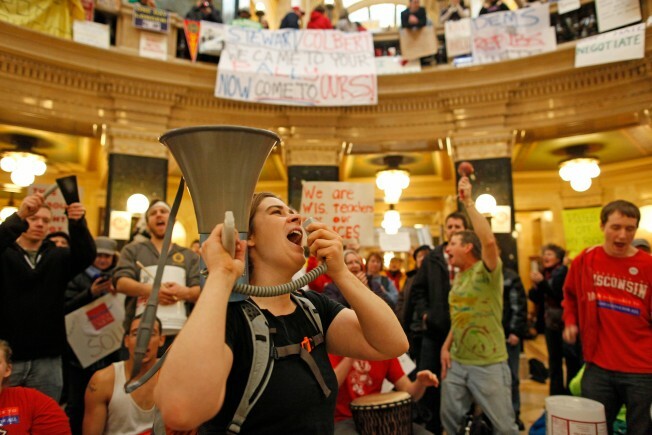 Protesters bang drums and shout slogans inside the state Capitol Monday, Feb. 21, 2011, in Madison, Wis. Opponents to Gov. Scott Walker's bill to eliminate collective bargaining rights for many state workers are taking part in their seventh day of protesting. Wisconsin Gov. Scott Walker is locked in a tense struggle with public employee unions and Democratic lawmakers over his attempts to end collective bargaining rights for many public-sector workers and to require workers to pay more of their pension and health care costs. How many states have laws that give public-sector workers the right to bargain collectively for better pay and benefits? According to a 2009 report from the Congressional Research Service, 24 states have laws giving all public-sector workers the right to bargain collectively. Nine states either do not have such laws or have laws that expressly forbid contracts between a public employer and a labor union. The rest of the states have laws allowing some government employees collective bargaining rights. The laws vary from state to state, with some states limiting bargaining rights to specific types of workers, such as teachers or police officers. Does government employees’ right to bargain collectively include the right to strike? Not necessarily; in fact, many states do not permit public employees to strike. Which state was the first to enact a law giving public-sector workers the right to bargain collectively for better pay and benefits? What percentage of public-sector workers belong to a union? According to the Bureau of Labor Statistics, last year 36.2 percent of public-sector workers were union members, compared to 6.9 percent of private-sector workers. Union membership was highest among local government workers, at 42 percent, with 31 percent of state employees unionized and 26.8 of federal workers. How do the earnings of government workers who are union members compare to the earnings of private-sector workers? In 2010, median earnings of government workers who were union members were 25 percent higher than earnings of private workers. “People who go into the public sector — especially at the highest occupations that require a lot of education — are trading off stability for higher salaries,” said Kim Rueben, a public finance economist at the Urban Institute. That is, such highly educated workers could likely make more money in the private sector but wouldn’t enjoy as much job security. “For lower educated workers, they actually do get a premium for being in the public sector, even on the wage side,” said Rueben. How do the earnings of unionized government workers compare to the earnings of government workers who aren’t union members? It depends on the level of government. According to Bureau of Labor Statistics data, for federal employees last year, the median weekly earnings of full-time wage and salary workers who were union members were $977. But the median weekly earnings of full-time federal workers who weren’t union members were $1,040. But for state workers, union members had median weekly earnings nearly 17 percent higher than non-union members, $922 compared to $769. And for local government employees, the union differential was greater, 23 percent higher wages for union members than for non-union members. Are unionized government workers more likely to be covered by a defined-benefit pension plan than private-sector workers? Yes, far more likely. A 2007 Bureau of Labor Statistics survey found that 95 percent of state and local government workers who were union members were eligible for coverage under a defined-benefit, or “traditional,” pension plan. Among private-sector workers, only 21 percent had access to a defined-benefit pension plan. According to the survey, 77 percent of state and local government workers who were covered by a defined-benefit plan had to make a contribution to it. The average contribution was 6.3 percent of earnings. Wisconsin Gov. Scott Walker told reporters Friday that many private-sector workers in his state do not have a defined-benefit plan and if they have a 401k plan, their employer may have stopped contributing to it. "That is in contrast to the very modest request we are asking (from state employees), which is a 5.8 percent contribution to the pension system and a 12.6 percent contribution from state workers for their health care premium," he said. "That's half the national average." For many workers in Wisconsin, he said, "they think that's a deal they'd love to have." He said private-sector workers with benefit plans far inferior to those of state employees are being forced to pay for those state workers' superior benefits. What’s the advantage of a defined-benefit pension plan? In what ways have some government workers used their employers’ rules to inflate their pension benefits? Some public sector contracts allow workers to work overtime in the final years of their careers, which spikes their salary and thus inflates their pension benefit. “When states like California went from having three-year averaging (formula to determine pension benefits) to one-year averaging they found that the cost of pensions went way up because people would just work a lot of overtime (in their final year), and that would be incorporated” in the formula used to determine the pension benefit, Rueben said. New York City Mayor Michael Bloomberg has proposed changing his city’s pension rules so that new employees couldn't work hundreds of hours of overtime at the end of their careers to inflate their final year’s pay and their pensions. Are unionized government workers more likely to get medical and dental benefits from their employer than private-sector workers? Yes. The 2007 Bureau of Labor Statistics survey found that 95 percent of state and local government workers who were union members were eligible for Medical benefits and 71 percent were eligible for dental benefits. Among private-sector workers, 71 percent were eligible for Medical benefits and 46 percent for dental benefits. The average share of the premiums paid by public employees was 26 percent for family coverage; in contrast, on average, private-sector workers paid 29 percent of the premium cost. Which states face the biggest problems in paying for the pension benefits of their retired workers? According to report last year by the nonpartisan Pew Center on the States, most pension experts advise at least an 80 percent funding level. The report said 21 states were funded below that level in 2008 and two states were funded below 60 percent of the assets to meet their long-term pension obligations: Illinois and Kansas. According to testimony this week before the House Judiciary Committee by economist Joshua Rauh at Northwestern University, the three states with the biggest unfunded liabilities as a percentage of their current tax revenues are Ohio, Colorado, and Illinois. In the case of Ohio, its unfunded liability amounted to 632 percent of its 2009 tax revenues, or more than $166 billion, using a return on investment calculation devised by Rauh and his colleague Robert Novy-Marx. “Under their own accounting rules, state and local governments have around $1.3 trillion of unfunded pension liabilities,” Rauh told the committee. The actual liability, he estimated, is more than twice that size.